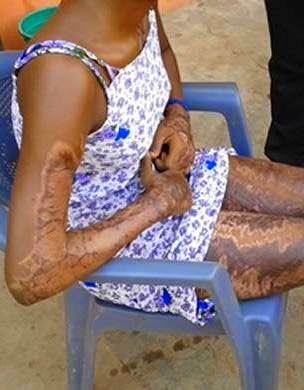 22-year-old Ghanaian lady identified as Anita Otema (pictured above) has lost her left eye and parts of her body badly disfigured after her ex-boyfriend attacked her with acid at her Abeka Lapaz residence in Ghana following his pastor's revelation that she was behind his constant ill-health. Narrating what happened to Ghana's Joyfm, Anita said her 28 year old ex-boyfriend Kwabena Fosu popularly known as Abodeman attacked her in the night at their home with the corrosive substance after his pastor accused her of being behind his recurring ill-health and told him she (Anita) was making money spiritually through his illnesses. 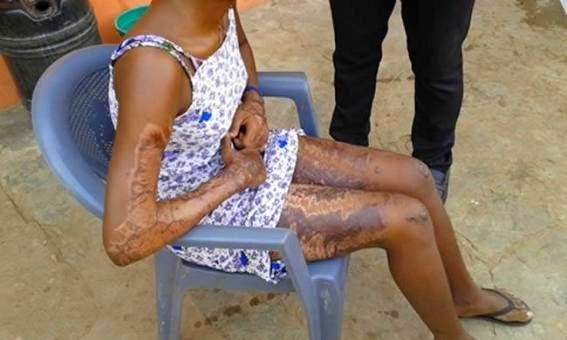 After her boyfriend was told this by the Pastor, he stormed their house where they both lived as a couple and poured the acid on her. He has been on the run since the incident.